Love, Mrs. Mommy: Little Adventures Makes Your Child Feel Like Their Favorite Character! Little Adventures Makes Your Child Feel Like Their Favorite Character! I received these items from Little Adventures at no cost to facilitate this review. All opinions are my own. 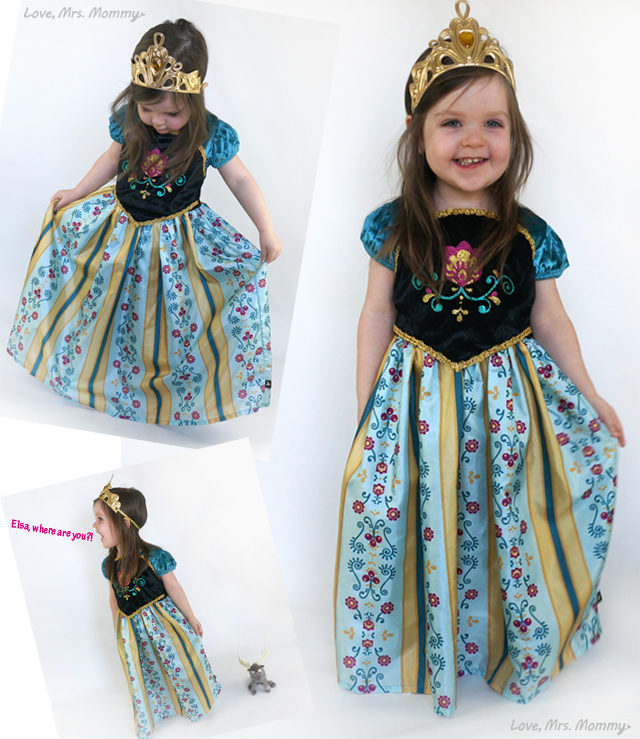 My daughter had the pleasure of picking out a few dresses from Little Adventures and she couldn’t be happier. She is enthralled with these dresses and looks forward to wearing them every day! We have had them for a little over 2 weeks now, and I wanted to see how they held up, and I could not be any more pleased! There hasn’t been a single rip or tear in any of the dresses, and they clean up beautifully! My daughter spilled some sauce on her Snow White dress and after using a wet-wipe, it was like it never happened! I haven’t had to put any of them in the wash, but with their quality materials I absolutely don’t foresee a problem with doing that. 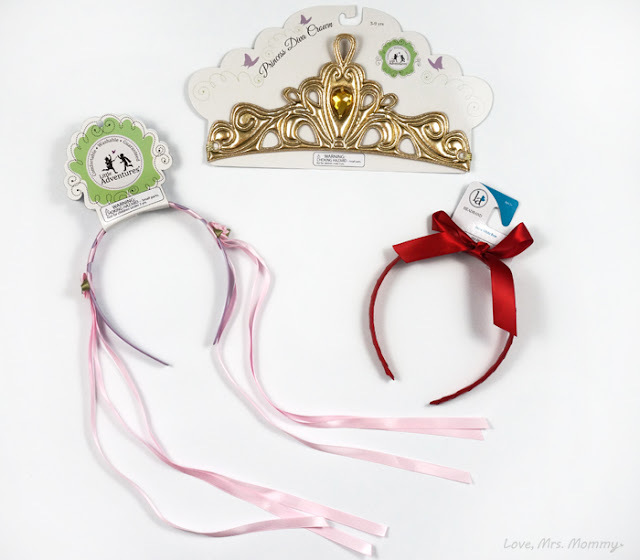 Not only do Little Adventures make and carry the most adorable princess dresses, but they have a wide range of accessories to go along with them! Everything from gloves, hair bands, capes, shoes, crowns and so much more. Your little one will be styling in their favorite princess gear! By the time my daughter finishes her breakfast, she’s ready to put on her first princess dress of the day. She always seems to put on her Scandinavian Coronation dress first. After twirling and playing for quite some time, then she’s ready to switch it up. 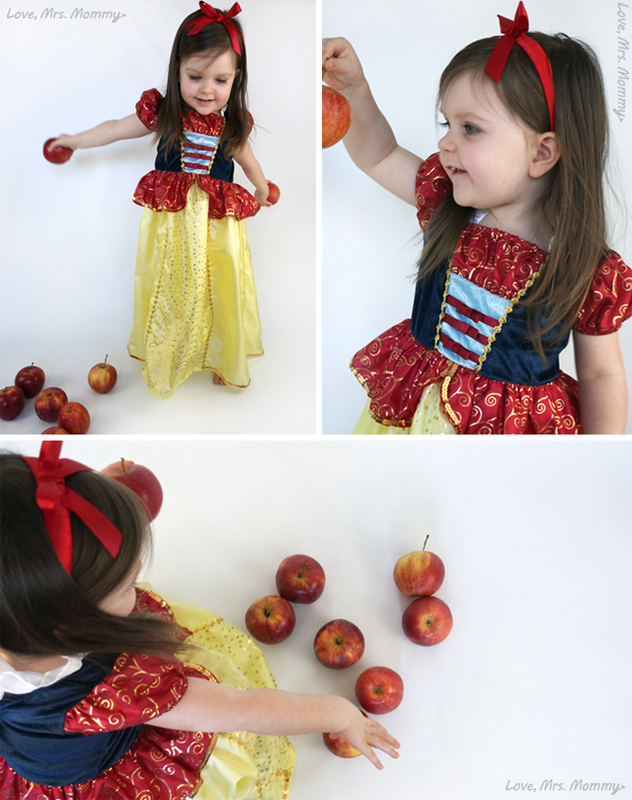 Some days Rapunzel’s dress comes next, then other days it’s Snow White… but one of them is always worn during lunch. I am never sure who I am going to get to dine with, but it’s always a fun time! It’s so sweet how much she loves her dresses and enjoys playing in them. She wants to wear them so much that I am starting to not remember what her every day clothes look like, haha! Whether it’s staying at home, or going to visit family, she either wants to wear one or bring them with her. She feels really special in her dresses and tells me how they look just like her favorite princess dresses. 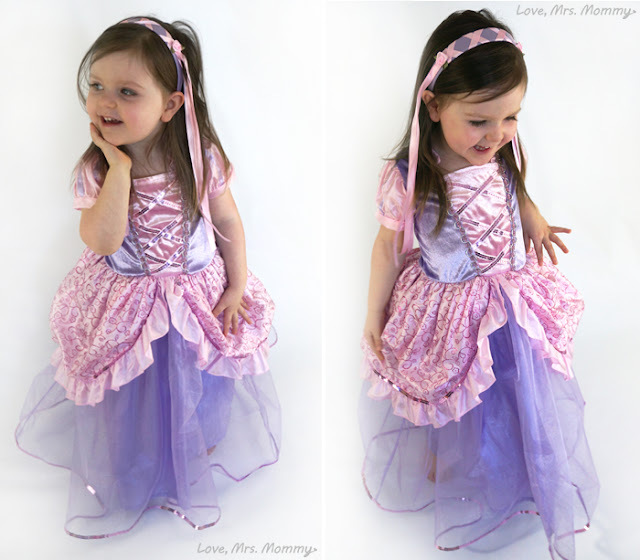 My little lady did own a princess dress before I partnered with Little Adventures, which made for a really great comparison. The other brand, right off the bat started to pill under the arms and the dress was very scratchy. With its stiff nature, my daughter didn’t want to wear it for any length of time. Then, after less than a handful of times wearing it, an unfortunate thing happened, it ripped. I don’t mean a little tear… the whole front overlay of the dress ripped off! It’s a sheer gauze-type material and it was shredded! Ugh! With Little Adventures, the difference is undeniable! From the moment I opened up the package and pulled out the dresses, I was amazed at the quality. Their attention to detail is outstanding and they really have thought of everything! The quality of the material was phenomenally soft, comfortable and easy to get on and off. The style and design of the dresses is true to character and in my opinion, cuter than the $75+ versions you find in some stores. For an unbeatable price, you get an outstanding value! Plus with Little Adventures, they offer a 100% quality guarantee! You just can’t go wrong with this company! 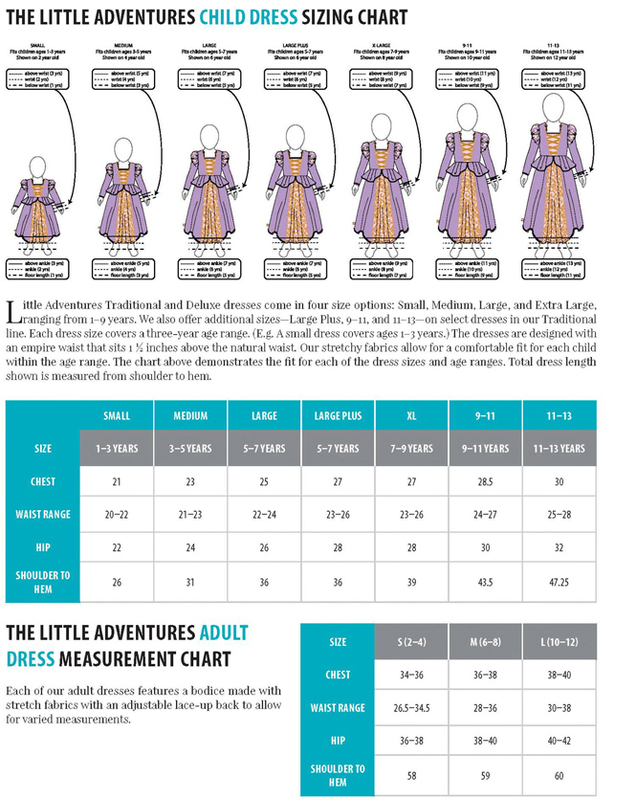 Their sizing guide is also really easy to use. I love and really appreciate how each dress can accommodate 3 years of wear!! For example a Small accommodates 1-3 year olds and a Medium accommodates 3-5 year olds, etc. Since they make all their own clothes, their measurements are accurate to their sizing chart. Talk about a money-saver and with their fantastic quality, they are sure to hold up through all those years of play as well! Have a little boy? Don’t worry, Little Adventures has them covered too! They carry everything from super hero, knights and dragons, cloaks, and more! Their fun array of boys costumes are just as cute and sure to please your little super hero! It’s no wonder why Little Adventures is recognized as a leading provider of quality dress-ups in the specialty toy market throughout the world. With their quality-driven clothing that’s comfortable to wear, and a parent’s dream of it being affordable AND machine washable… well, how can that be beat?! Connect: Find out more about Little Adventures by visiting their website. Then make sure you “like” them on Facebook and follow them on Instagram. Buy It: You can purchase all the wonderful dresses shown in this review on their website. Happy shopping! I absolutely adore these! They are super cute! That pirate outfit would be Perfect on my 3 yeat old! Thanks for sharing with us! Wow, these are beautiful! I LOVE that they don't have glitter! I think glitter is so pretty but wow does it make a mess! My daughter loves Snow White! That is the cutest thing ever! This looks like so much fun, and your daughter looks adorable! OH my!! The quality of these dresses are just amazing!! So pretty!! I love that they are made to last!! These outfits look amazing!!! I love the variety of sizing so that children of all sizes are able to wear them! My daughter and nieces would have a fabulous time with these dresses!I love the Scandinavian dress the best because the style and design in more unique. Although i wasn't the dress up type when i was a kid.These girls look so beautiful in their dresses. The dresses are so cute! My cousin would love one. These dresses are darling. My granddaughter loves dress up and she is 3 years old. These are adorable. They look really well made also. These are just so cute. The grandkids would like one of these. My niece has an outfit from them. We were pleasantly surprised at how good the quality of it really was. My grandson loves to dress up in fun outfits...especially the pirate! These costumes are adorable, the grandkids would love them! The only problem would be to pick them out, they would want them all. You have to have a prince for a princess and they have you covered in all those areas. These are so pretty! My daughter would love any of these!